For about a decade and a half now, Win has worked as a local ski tech, currently plying his trade at the Ski Surgeon, tucked beneath 80|50 in the Village, across from Burgers. Since Win, like most “non-Trustafarian” ski bums, does have to come in out of the mountains every once and while and actually work for a living, he prefers to work at night, so he can ski by day. After spending his early ski bum years slaloming through the usual ski bum gigs like restaurant and hotel work, Win eventually decided to take a job as a Ski Tech. Little did he know that the dreaded four-letter word of work would turn into the five-letter word, trade. “So when I decided to get into this I went to Rhubarb Marcellin, a real skiing architect on the Eastside and one of the best ski techs in the west, if not the whole country, and I asked him to teach me everything he knew. Little did I realize how valuable a skill it was,” Win said, as he de-tuned the tips and tails of the Rossignols. “Rhubarb was older than I was by about 20 years and we were in different places in life. But we were able to connect because we both shared a passion for the sport of sliding on snow,” said Win, a self-described “California hillbilly” who didn’t start skiing until the relatively late age of 24. As for the keys to being a real ski surgeon, Win said they’re pretty basic. First and foremost is good training, like what he received from Rhubarb. The second is taking pride in your work. 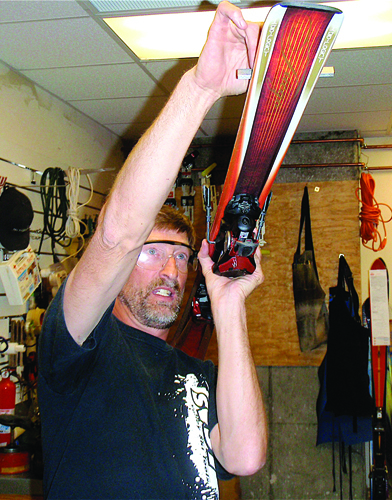 “Part of the skill of a good ski tech is doing a top quality, professional job and not just a slam-bang, compromised job,” Win said, as he turned on the base welder. As for tuning tips for the non-professionals, Win’s advice is simple: don’t do it. “People shouldn’t mess with their own settings and gear, it just increases their chances of getting hurt,” he said, as he P-Texed a core shot on the Volkls. While snow conditions and usage generally dictate how often a ski or board should be tuned or waxed, Win recommends that you get your skis tuned up at least every 30 days of use and at the beginning of each season. He also recommends skiers follow this schedule for Function Tests on bindings. “Good maintenance of your equipment is a small price to pay for a little leg security,” he said, before taking the Volkls to the grinder. The Ski Surgeon specializes in over-night repairs and tune-ups and they can get even the most beat up skis and boards ready for fresh tracks the next morning. And it’s seems like Win’s famous piano playing relative summed up the family bloodline perfectly when he once said, “I was born feet first and I’ve been jumpin’ ever since.” The only difference is that Win—like many a Mammoth ski tech—likes to do his jumpin’ with his freshly tuned skis on his feet. Mike McKenna is the Editor of the Sun Valley Magazine, author of “Angling Around Sun Valley” and a winner of numerous writing awards. Email him at mwesleymckenna@yahoo.com.